As a pet parent, there are few things scarier than having an emergency situation or health crisis arise and not knowing what to do. Dogs and cats are naturally curious creatures, and like children, they often get into things or places that they shouldn’t. Supervision and responsible ownership will prevent a lot of issues, but sometimes a naughty dog or rascally kitten can sneak past even the most watchful guardian. There are also events you can’t control at all, like natural disasters. Frantically trying to Google information, locate supplies, or formulate a plan in the heat of the moment can make an already stressful situation that much worse. This is why it is so important to be prepared for the unexpected. In the past, we’ve had Cheryl from Vet Care Express (“Driven By Compassion!”) come to the shop and teach an American Red Cross pet first aid & CPR class. Vet Care Express is a pet EMT/ambulance service currently operating in Manatee and Sarasota counties. They are available to help pet guardians in the event of an emergency, and they also partner with vet clinics and other organizations for delicate/medical transport situations. Here are some lessons we learned to be prepared, protect our pets, and take action in an emergency. 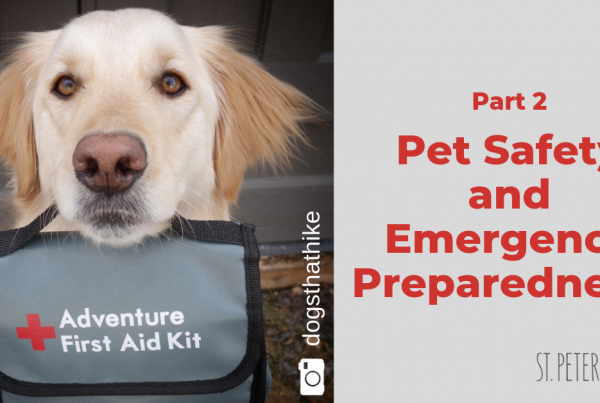 Assemble or purchase at least one Pet First Aid Kit, preferably one for home, and a smaller one in your car or for travel/walks/adventures. You’ll want your first aid kit to be in a clearly-labeled, waterproof container. Know exactly where your kit is and check it periodically for missing items and expiration dates. We have the 40-piece Alcott Explorer First Aid Kits available for purchase here at St PetersBARK, but if you want to make your own, we’ll give you a list of supplies in Part 2 of this blog series. Have the phone numbers for your veterinarian, a 24-hour emergency vet, and poison control written down in one place. Know where the nearest emergency vet facility is. Check if you have a pet ambulance that services your area. One that currently services Pinellas county is the SPCA Of Tampa Bay.  Post this information on the fridge, in a drawer, and/or with your first aid kit(s). Develop a plan in case of disaster ie fire, flooding, hurricane, etc., and in case you and your family are evacuated from your home. Know which disaster relief shelters are pet-friendly. Having your kit and making a plan are wonderful but you’ll still need to know how to execute those things. Here are a few things you can do to keep yourself fresh with pet first aid knowledge. Attend a Pet First Aid class. There are a few organizations that offer online pet first aid training, like the American Red Cross. Get to know your pet’s individual standard for “normal”. Be familiar with bathroom habits. 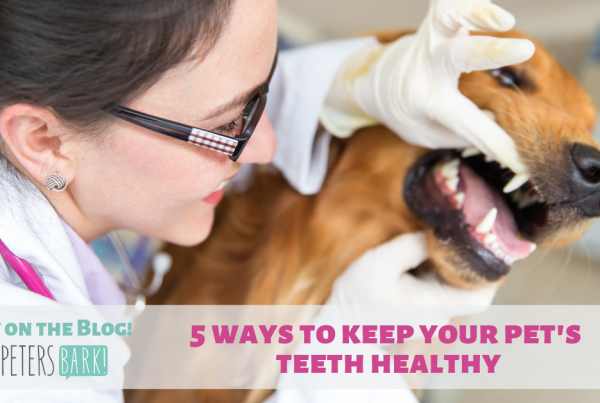 Examine your pet’s gums for what they look like in a healthy state. Be hands-on with your pet and spend some time practicing checking vital signs like pulse, breath rate, capillary refill time, and temperature (never practice CPR or the Heimlich on a breathing, healthy animal). The more you know your pet and the more comfortable you are handling them, the easier it will be to tell if something is wrong and get them help. Always choose toys, treats, and bones carefully. Remember that dogs are descended from wolves and have teeth designed for ripping and shredding flesh and for grinding bone. Any chew or toy has the potential to splinter or become shredded. Select items that are appropriate for your pet’s age, size, and chewing style. Always monitor playing and chewing, especially with puppies or when giving any new items. 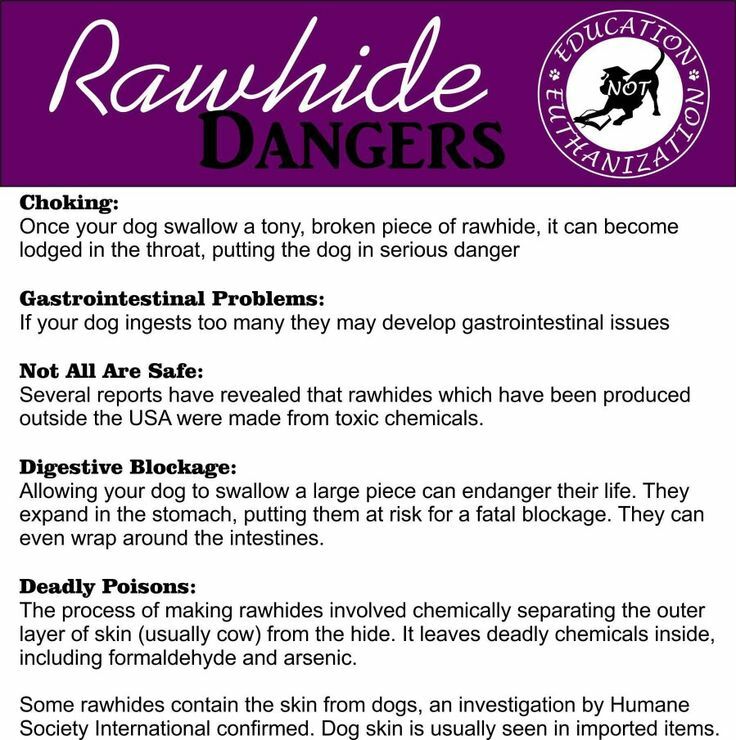 Be cautious with rawhide chews, which may contain harmful chemicals, pose an increased choking risk,and lead to intestinal obstruction. The Pack Members at St PetersBARK would be happy to help you pick out an alternative to rawhide. Learn pet CPR and the Heimlich maneuver for choking pets. Print out the instructions for both and hang it on the fridge, in a cabinet, or store it with your Pet First Aid Kit. If your dog is a breed that is prone to bloat, print out and hang a bloat chart for easy reference. Be aware of issues that may be specific to your pet’s breed or type (ie increased heat intolerance/respiratory issues in brachycephalic (short-snouted) breeds, bloat in large-breed, deep-chested dogs, trachea issues with small breeds), as well as dangers specific to the area you live in (ie Sago palms, Bufo/cane toads and alligators in Florida). Educate yourself on how to protect your pet and the signs and symptoms of potential distress related to these issues and hazards. Be aware of dangers to your pet that may not exist for humans, or that may be less serious for us two-leggeds. Hot weather may make exercise dangerous during the day, putting your dog at risk for heat stroke and/or burned paws due to hot pavement. Don’t even think about leaving a dog in a car, even in what may seem like mild, warm weather! The consequences can be deadly and in many states (including Florida), it is against the law. Leaving the car running with the A/C blowing is a false sense of security. If the A/C system or engine fails, the dog can suffer and die quickly, and cars have been stolen this way, with the pets inside. Although we don’t experience many frigid temps in Florida, pets get cold too and living in a mostly warm climate can be even more shocking to their system. 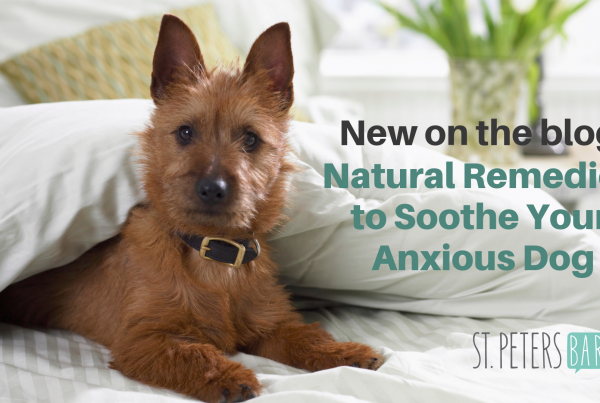 Take necessary precautions if your dog spends time outside. Educate yourself on food hazards for animals such as chocolate, grapes, onions, cooked bones, and sugarless gum, and other household hazards including empty chip bags, dryer sheets, plastic bags, toxic houseplants/garden plants, or cleaning agents. Don’t leave these items where pets can get to them. Always keep your pet leashed in public places to avoid putting your pet, other pets, and people in dangerous situations. Adhere to park rules and leash laws and only allow your pet off-leash in designated areas and dog parks. Respect the DINOS! Always keep your pet restrained while riding in a vehicle. Use a crate, pet car seat, or car harness. This will protect you and your pet during the ride and in the event of an accident or abrupt stop. Periodically walk the perimeter of your yard and the area within to check for fence holes, sharp objects, stagnant water, poisonous plants, and other things that may be dangerous for your furry companion. Don’t leave your pets alone in your yard for extended periods of time. Our pets’ genetic relatives are wild and able to fend for themselves, so sometimes it’s easy to forget that the dogs and cats that we count as family members really rely on us to do what’s best for them and keep them safe. They’re like furry toddlers! So keep your eyes on them, protect what you value, and like the American Red Cross says, “Get a Kit, Make a Plan, & Be Informed!” Keep your eye out for our next post, and we’ll tell you exactly what you need to put together a Pet First Aid Kit.